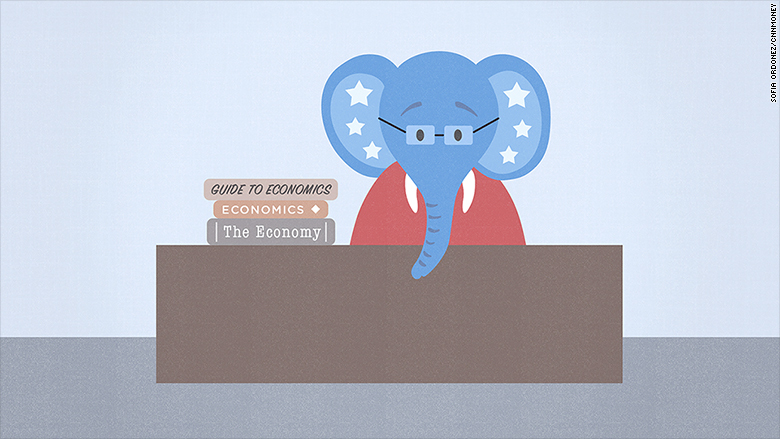 Are Republicans becoming econ nerds? Republican presidential candidates are hitting the books to prepare for the first debate of the 2016 election. Things could get a little nerdy when the economy comes up in the August 6 debate hosted by Fox News. Four years ago, America was still in a hangover from the Great Recession. Then presidential hopeful Mitt Romney found it easy to hammer President Obama on the big issues like high unemployment and lackluster job growth. But the 2016 field is digging into the weeds. Donald Trump banters about America's trade deficit to voters. Rick Perry, Ted Cruz and others start some stump speeches by mentioning the labor force participation rate. Rand Paul wants to reform how the Federal Reserve conducts monetary policy. Jeb Bush unintentionally sparked debate about labor productivity and costs. "Those [concepts] will be foreign to most people," says Dean Baker, co-director of the Center for Economic and Policy Research, a left-leaning think tank. America's economic gains -- and remaining potholes -- are making the 2016 Republican field reshape their criticism of the Obama economy. That's why the nerdy measures are coming to the fore. At the time of the first Republican debate in 2012, the unemployment rate was 9%. Now it's 5.3% -- close to what many economists say is full employment for the United States. Related: What exactly is Trump's economic policy? America added only 103,000 jobs in May 2011 when the debate took place. Last month, the economy gained 223,000 jobs, a healthy figure. Last year was America's best year of job growth since 1999. "How can they credibly assail unemployment with the rate at 5.3%?" says Greg Valliere, chief political strategist at Potomac Research Group. Stressing economic problems: Instead of "Obama-bashing," the debate's winner will be the candidate who offers clear policies on issues like economic growth, budget reform and taxes, says Valliere. Republicans argue that the unemployment rate doesn't tell the whole story. Fewer American adults overall are working, home ownership is down and millions are suffering with loads of student debt. "The Republicans need to get beneath the headlines," says Peter Schiff, CEO of Euro Pacific Capital. "Hopefully they will stress just how bad this economy really is." Schiff says inequality, student debt, real estate and the Federal Reserve are still major problems the Republicans can attack. Some metrics -- like labor force participation -- were used by Romney in 2012, and both sides of the aisle aren't strangers to them. But labor force participation, the trade deficit and worker productivity weren't used nearly as often when Romney was out talking to voters. Another issue Republicans are likely to sidestep is the impact of the Affordable Care Act on jobs. For years, Republicans said Obamacare would put many workers in part-time jobs they don't want. So far, that has not happened. "Things get taken off the agenda because they're not going to sell," says Baker. "That would be an admission that things have certainly improved."